This website contains affiliate links from merchants like Amazon and Booking.com. As associates of these merchants, we will earn from qualifying purchases when you click on these links. We sincerely thank-you. 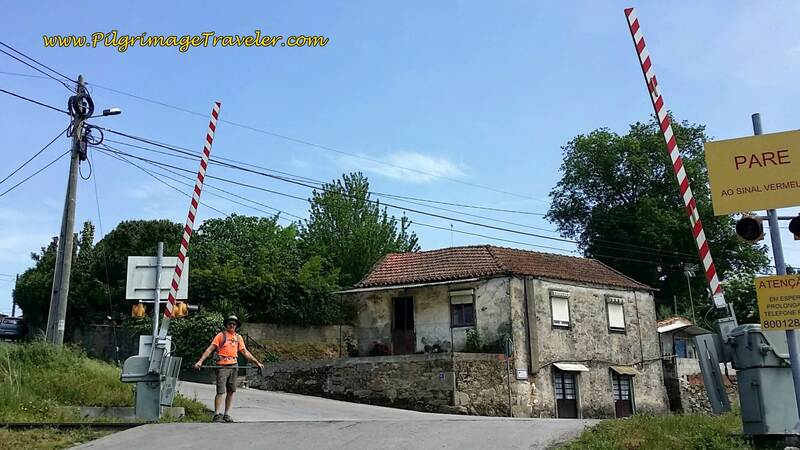 Our day thirteen on the Camino Portugués was full of interesting railroad crossings, a walk on a medieval bridge, through the historic town of Bemposta and up and down many hills. While the hills made the walk more difficult, it also made it much more interesting. 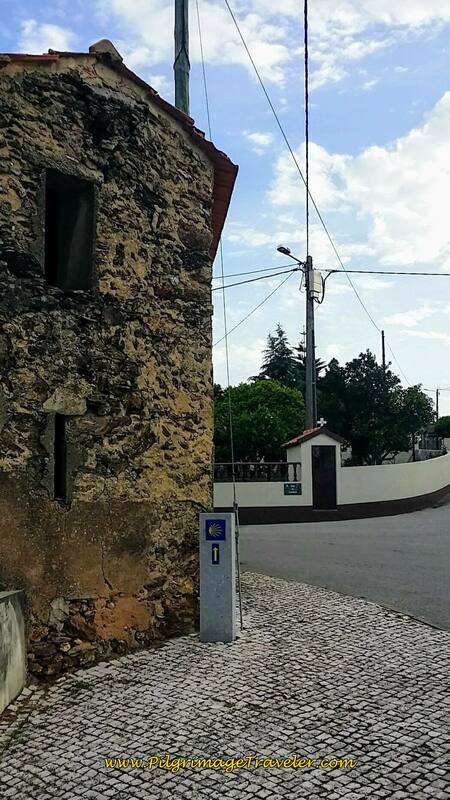 While this day thirteen was shorter than we had grown accustomed to, one could actually extend the day another 3.5 kilometers to Escapães and stay at the Casa da Álvore, an albergue we passed on this day (scroll down to see more info). 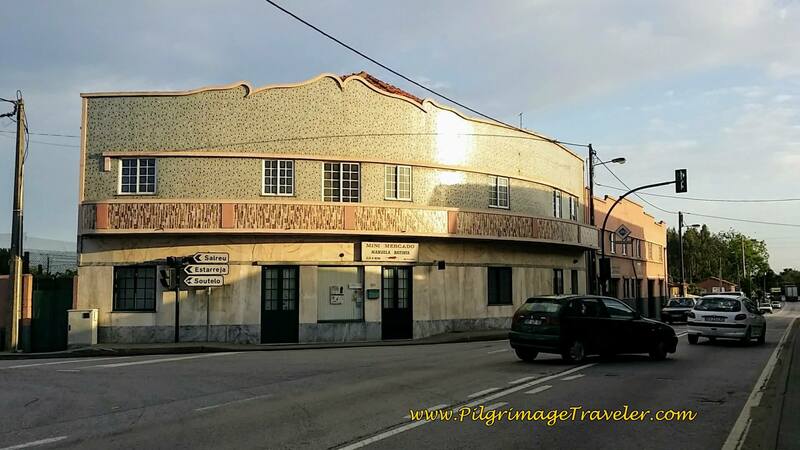 We did not know about this albergue. It was not in any of our guides. Had we known, we would have most likely stayed here. We would have loved to shorten our day fourteen, which turned into a 32.67 kilometer day! 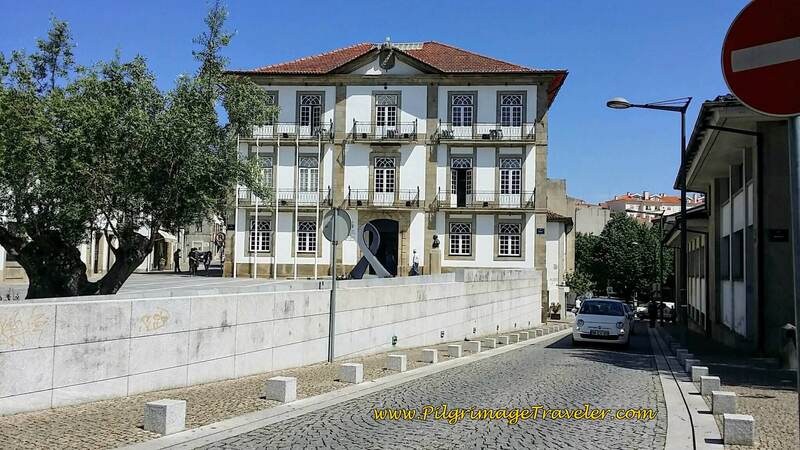 We did actually shorten it by a couple of kilometers by staying at the Holiday Inn in Vila Nova de Gaia, a southern suburb of Porto. We had points saved up that we wanted to use for our two nights there. If we had walked on to the cathedral Sé on day fourteen it would have been a total of 34.5 kilometers. 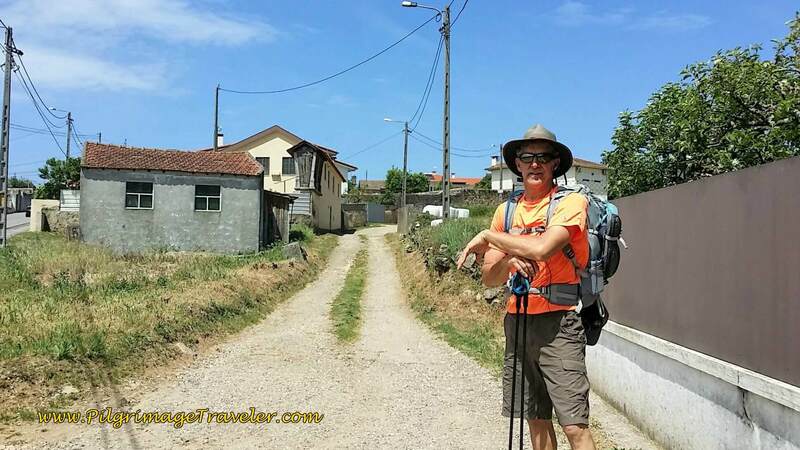 We found the actual walk on day fourteen to be farther than most guides say, according to our GPS, so some planning ahead on day twelve and thirteen might save you some headaches on your final leg into Porto. 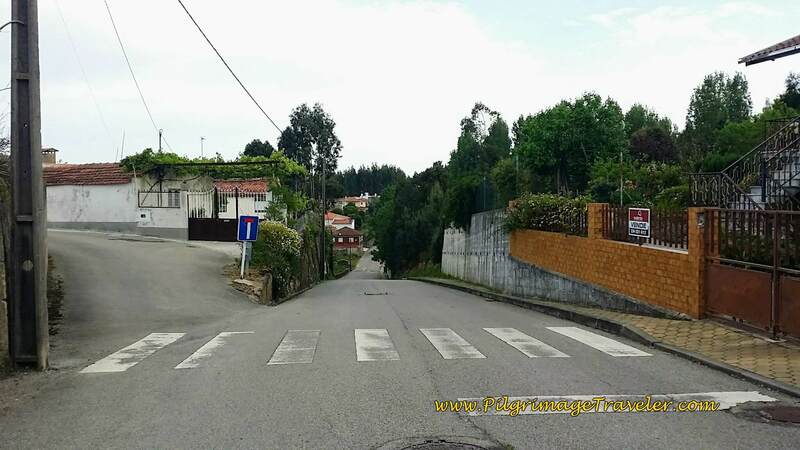 Alternatively, if you don't like albergues, and have the energy to lengthen your day thirteen, you can walk and additional 7 kilometers from São João de Madeira to Malaposta. 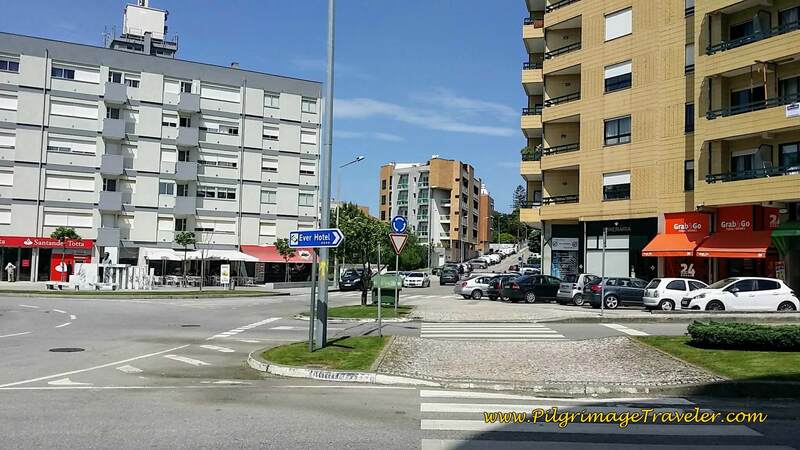 There is the Hotel Feira Pedra Bela, right along the Way. 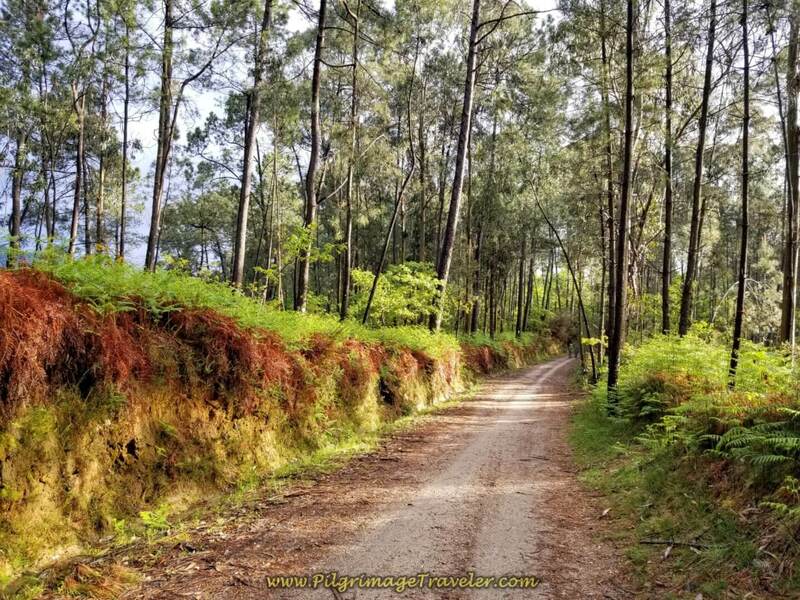 Or, your third choice to shorten day fourteen, is to make it two stages with a stop in Grijo at 19 kilometers from Sâo Joâo de Madeira. 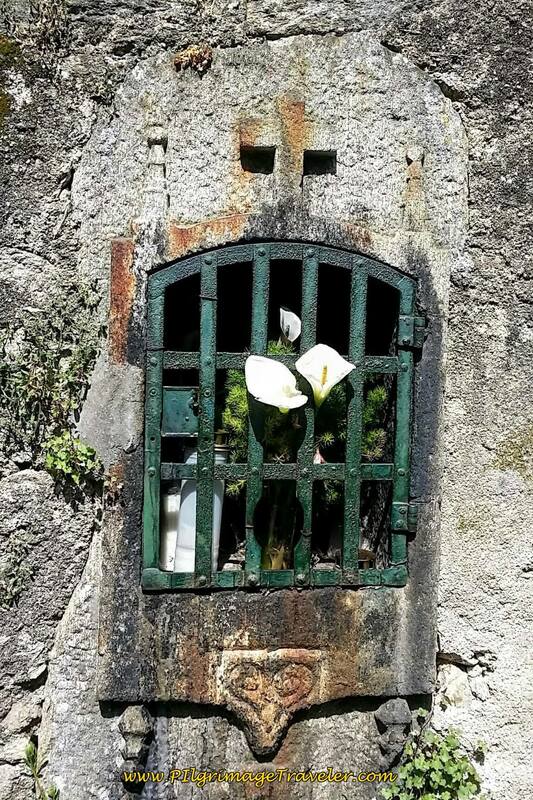 There is an albergue in Grijo, if that is important to you. (Scroll down to see a photo of it). Wanderer, there is no road, the way is made by walking. one sees the path that never will be trod again. Wanderer, there is no road - Only wakes upon the sea. Caminante, no hay camino, se hace camino al andar. se ve la senda que nunca se ha de volver a pisar. 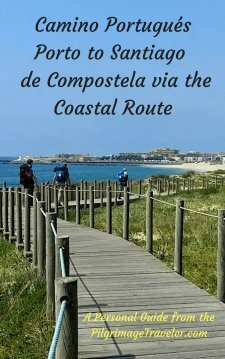 Caminante, no hay camino, sino estelas en la mar. Here is my Google map from my GPS files. 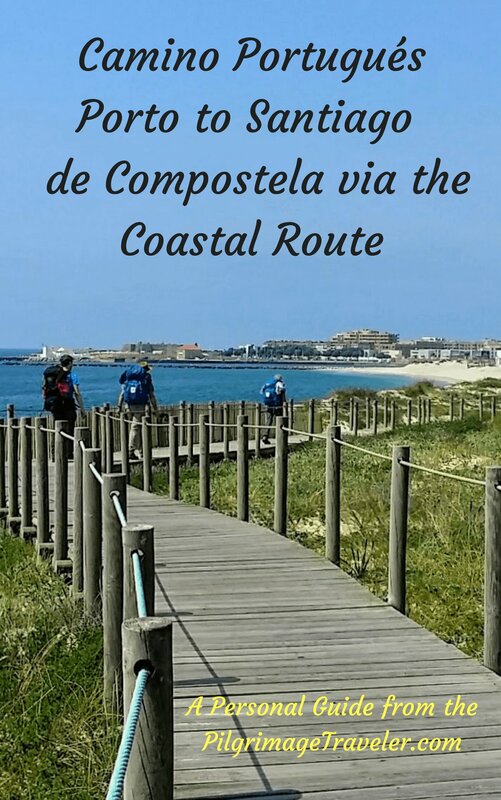 For a full list of accommodation, in addition to the ones I show on the map where we visited, click here. Zoom, pinch move around the map - it is interactive! You will notice some extra points if you zoom in ~ A and B on this map of day thirteen on the Portuguese Way. It is because we failed to see a yellow arrow for a turn and went the wrong way briefly. 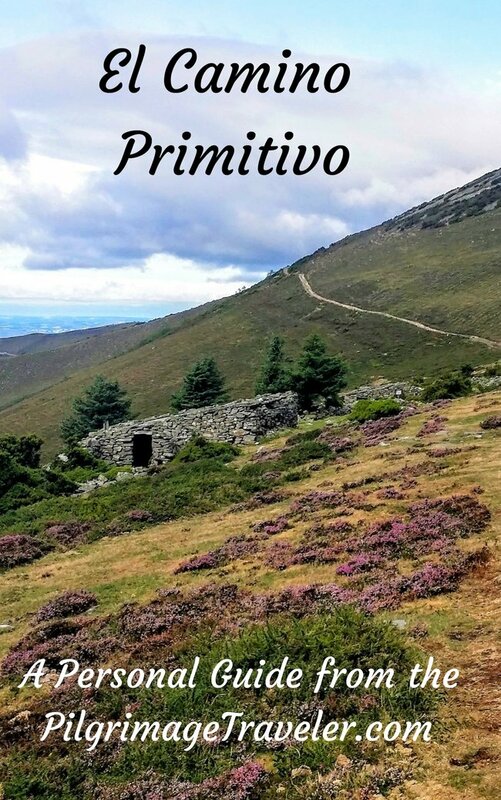 I drew in the actual Camino from Point A to B, and kept our walked tracks intact. Somehow I managed to turn off my GPS when we lost the Camino with all my frantic button pushing on my phone, so that is why there are two elevation maps for the whole day. There is some climbing on day thirteen, but nothing that is difficult or prolonged. 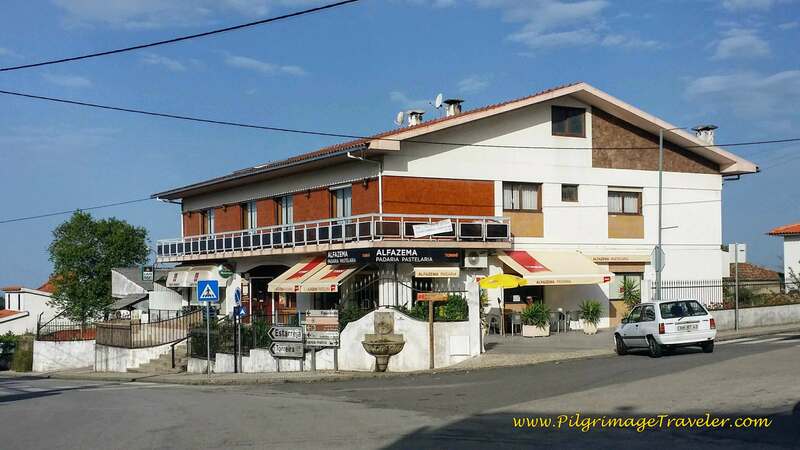 We started off our day with full bellies, after the Albergue Albergaria-a-Nova's hearty and inexpensive continental breakfast. It was lovely to start out this way and yet the day was heavy with humidity as we set off north on the N1. My own heart was heavy setting out, and I had a hard time getting into the rhythm of the walk. It was oppressively humid this morning and we shed our layers quickly. I couldn't seem to get anything right this morning, my water tube, my walking sticks, my pack, nor my hair! Nothing felt right. The loneliness and repetition of it all was weighing on me. Everything felt so redundant. Even the photos I was taking seemed like the same ones I had taken the day before! The trucks rushing by, bothered me too on the main road! I forced myself to reflect on the redundancies of life. How do I deal with the ins and outs of it? How do I deal with the boredom versus dealing with events that shake up my life? All good questions, that were there for me to continue to consider. Walking on the busy road, though noisy was at least safe with the nice cobblestone sidewalk for pedestrians. 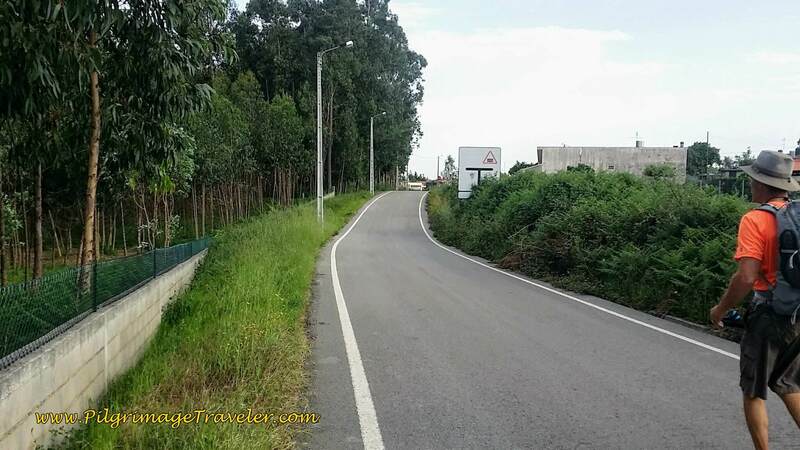 The way diverts to a side road to the right, off the N1, within a few hundred meters. 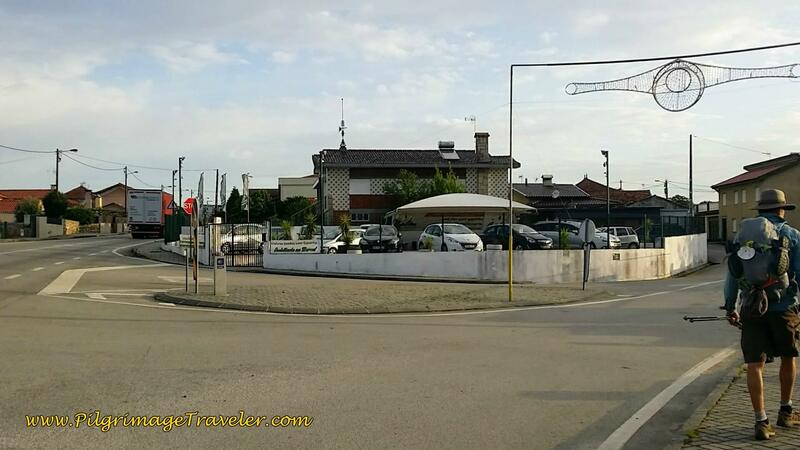 If you need food passing through here, stay on the N1 for a bakery as the Camino rejoins the N1 a short distance ahead. 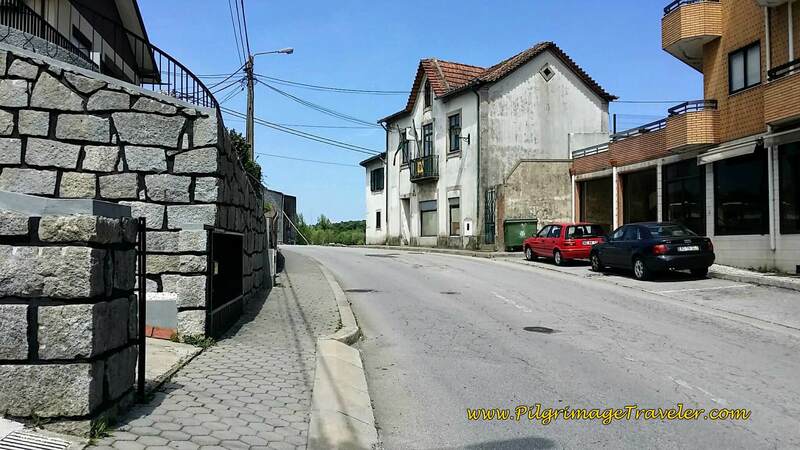 The Camino rejoins the N1 and walks north to the main intersection with the N1-12 at the center of Albergaria-a-Nova, below, with a mini market in this gold building and to the right the Tomas Café. More opportunities for you for obtaining food! 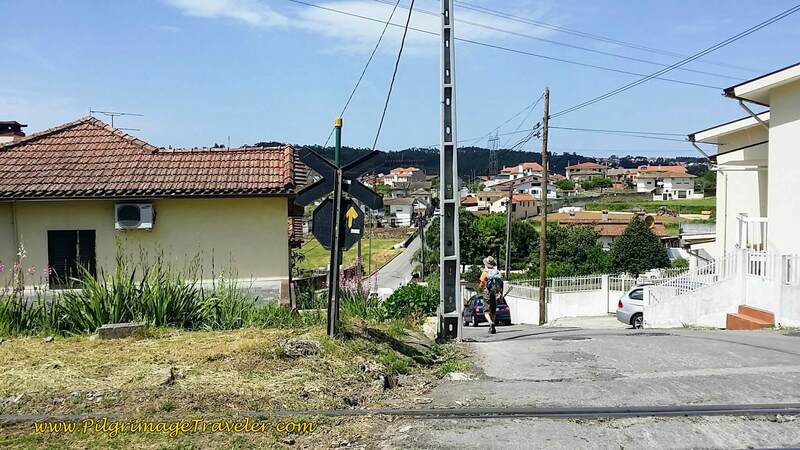 Several hundred meters from the center of town, we turned left off the N1 to follow a less-traveled road along the railroad. 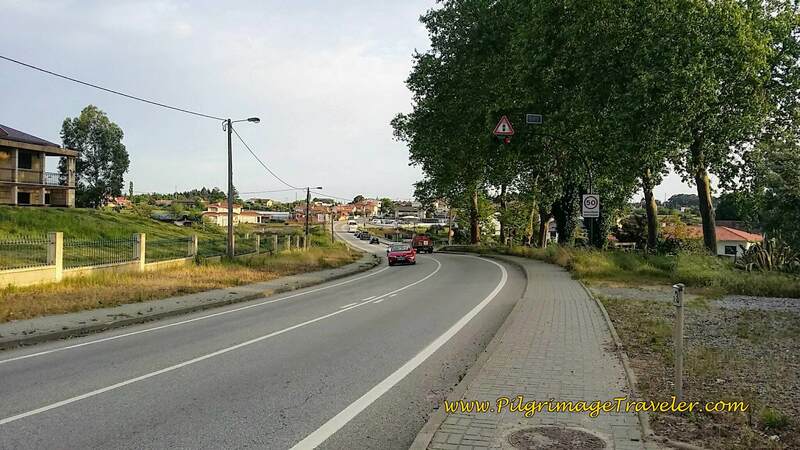 Here day thirteen on the Camino Portugués follows the same path as the N1, but west and parallel to it on an unnamed road. We encountered the construction of a sidewalk below, that I found interesting. 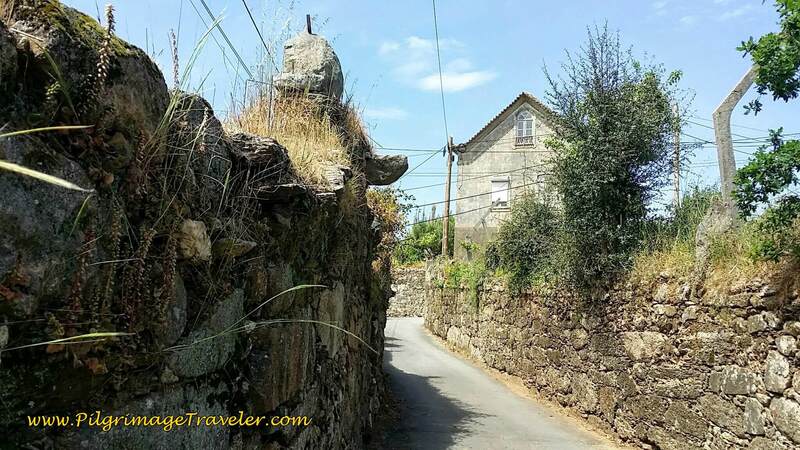 The Portuguese love their cobblestone! Onward, and we stayed to the right, here. 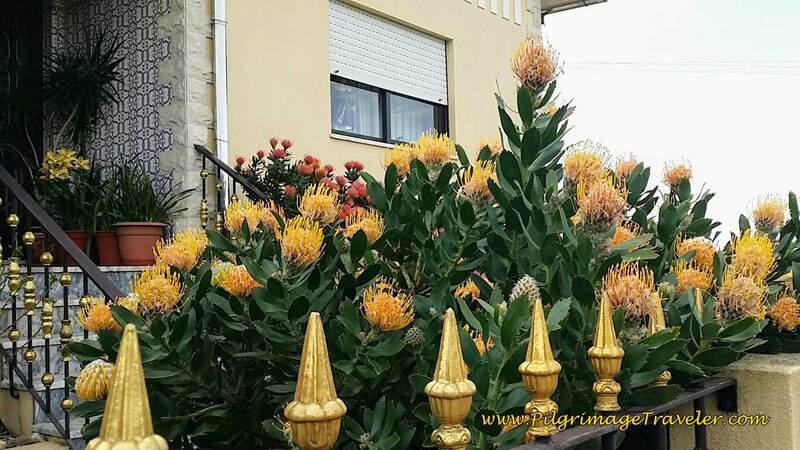 A lovely home graced us, with the King Protea, a tropical flower that matched their iron fence ornaments. I loved it! 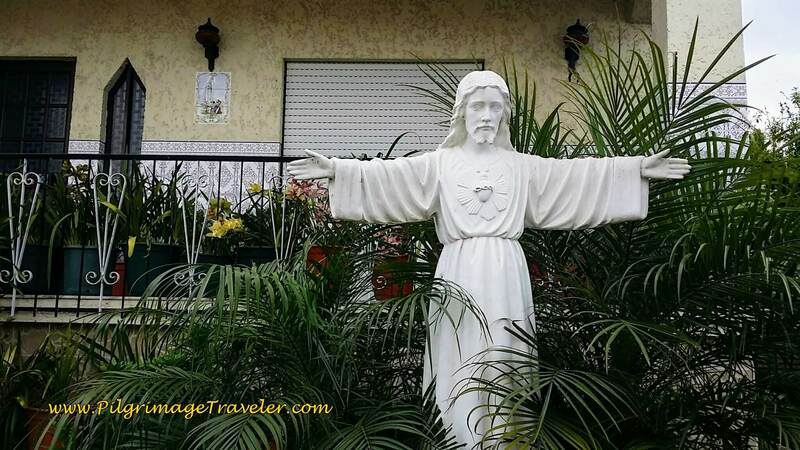 And in the garden of the same home, a statue of Jesus with the sacred heart and arms wide open drew me in. I was grateful for the homeowner for this. I felt loved. 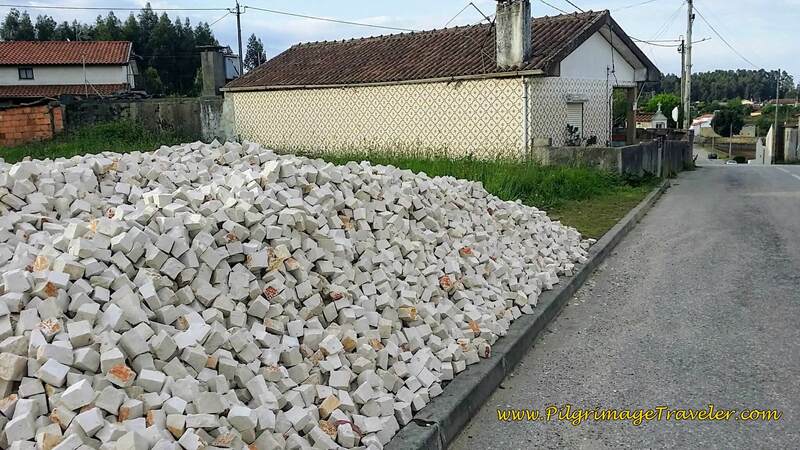 Less than a hundred meters onward, and we saw this pile of cobblestones! It was the cache for the sidewalk construction we had seen earlier! I was very intrigued by this amazing and time consuming process. 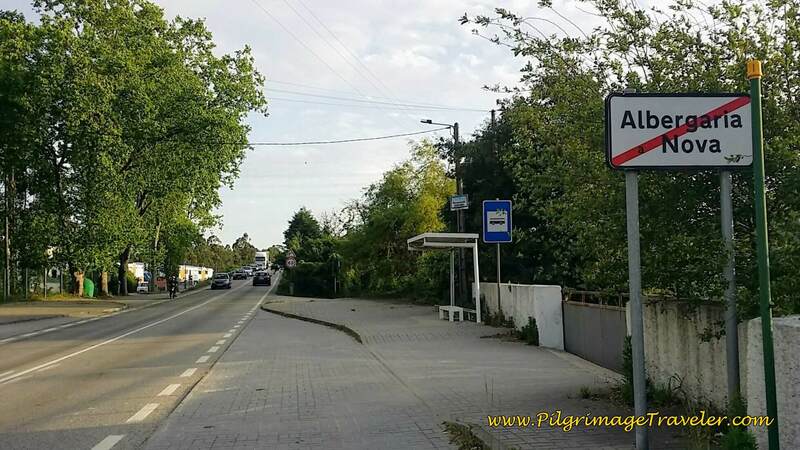 Next the pilgrimage travelers crossed the EM533 and turned left on the CM1453-1. We were walking on quiet roads, still paralleling the N1 through rural areas. The road is still paved, but quiet as it continues on the CM1453-1. 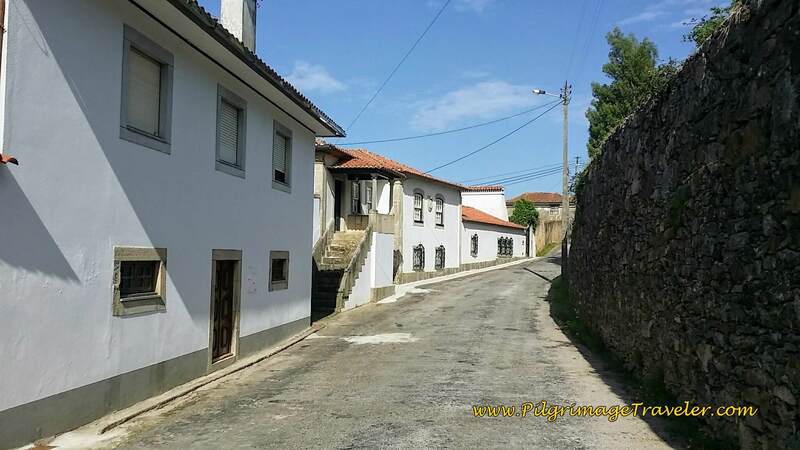 Continuing on the Cm1453-1 for about a kilometer, we stayed right on the Estrado dos Reis. 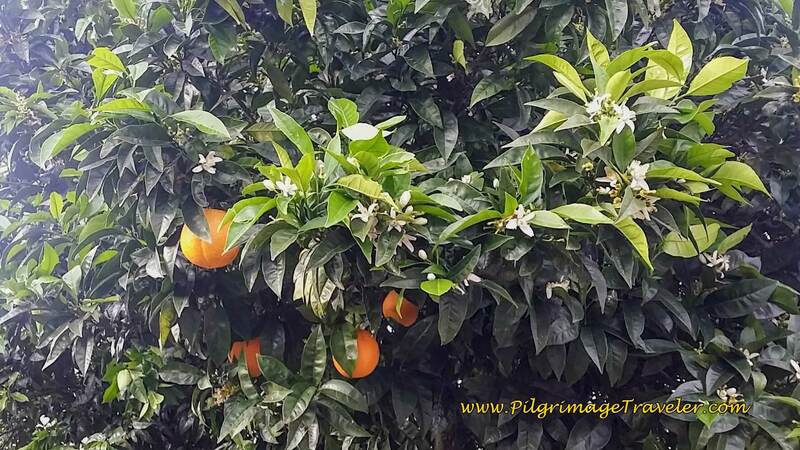 It was along this road that I noticed that the orange trees carried both fully ripened fruit and blossoms. Does this mean the tree bears fruit for many weeks? If so, what a wonderful thing! We continued to help ourselves to them when they were just by the wayside. 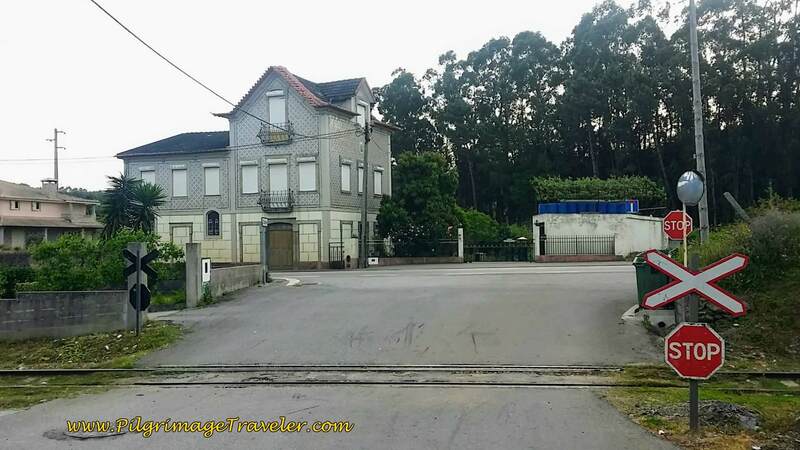 The Estrada dos Reis ends here, at this railroad crossing and at the junction of the N1. 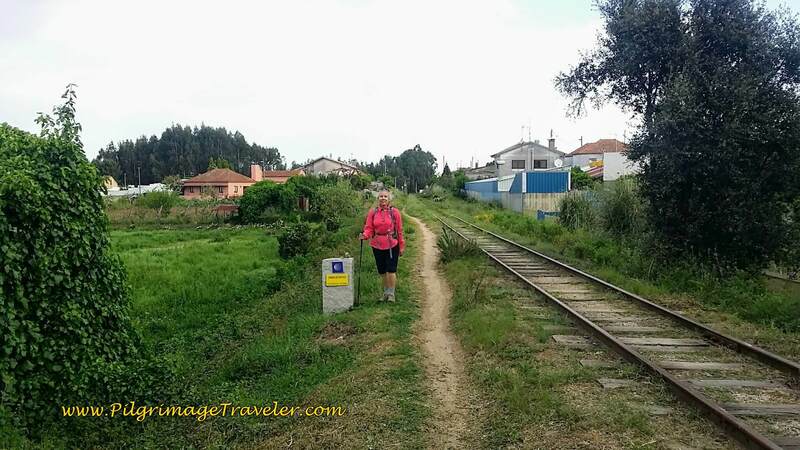 I was very happy not to cross over the railroad track to the N1, but to follow it along this wonderful path. There is something about railroads and the tracks that spark our imagination, isn't there? The vagabundo concept, the life of a wanderer, I think, that is so appealing. And here I am, confirming this is the way to go as I stand next to the Waymark for Rich to snap a photo. 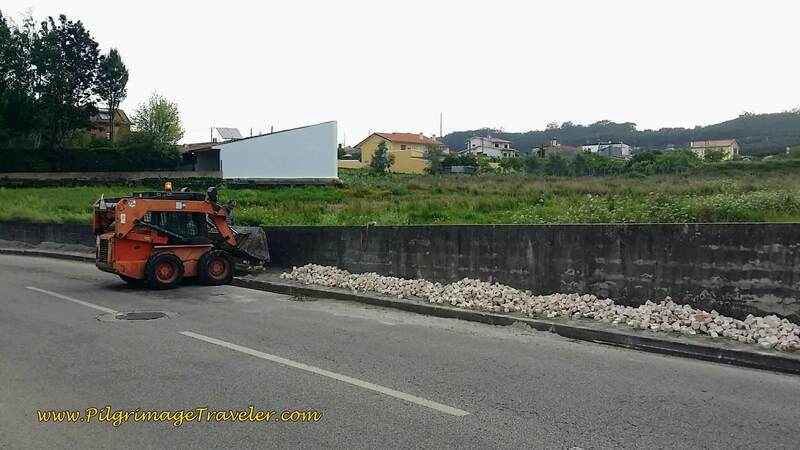 Our Camino just took a turn for the more interesting! 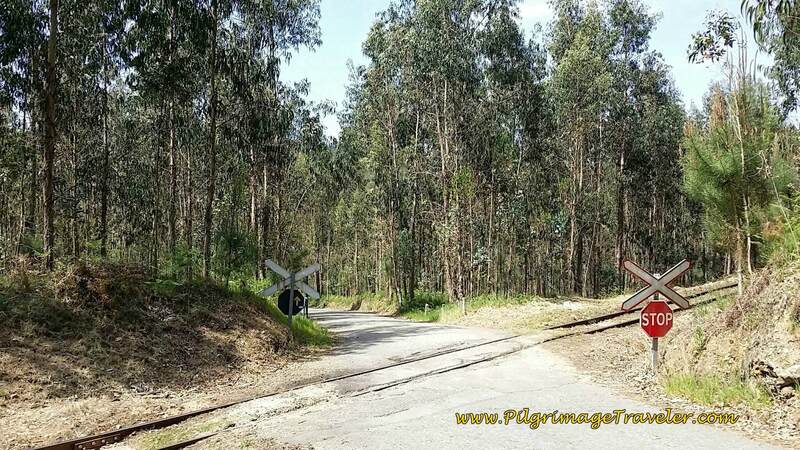 This railroad path, unfortunately, lasted only briefly and then back on the pavement of the Rua Tinturaria we went. 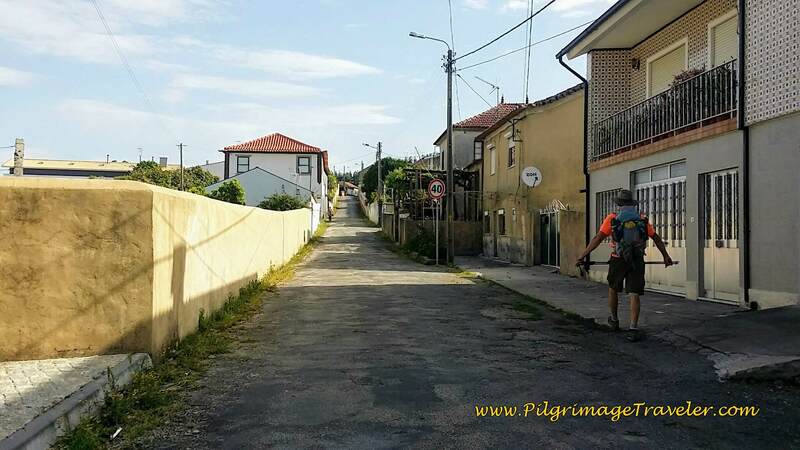 Following the waymarks, on country paved roads, we took three more right turns, and then a final right on a more major road, the Rua de São Paio to walk into the town of Pinheiro de Bemposta. 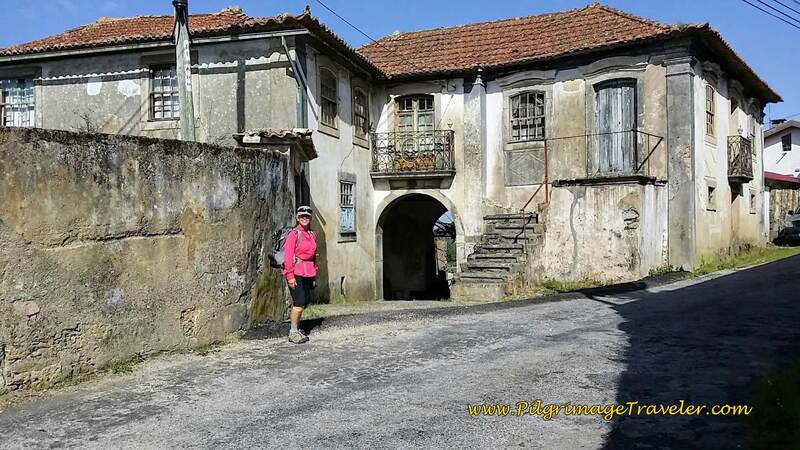 We walked up a small hill and soon came to the square in Pinheiro de Bemposta and one of the best cafés we had been to along the Way, the Alfazema Pastelari, shown below. We had logged in about six kilometers, a bit early for a stop, but the place looked too inviting to walk on by! We knew to seize an opportunity when it presented itself! And what a delightful break it was! As I sat in the pastry shop, I noticed my mojo started to pick up! It's phenomenal what caffeine and sugar will do! 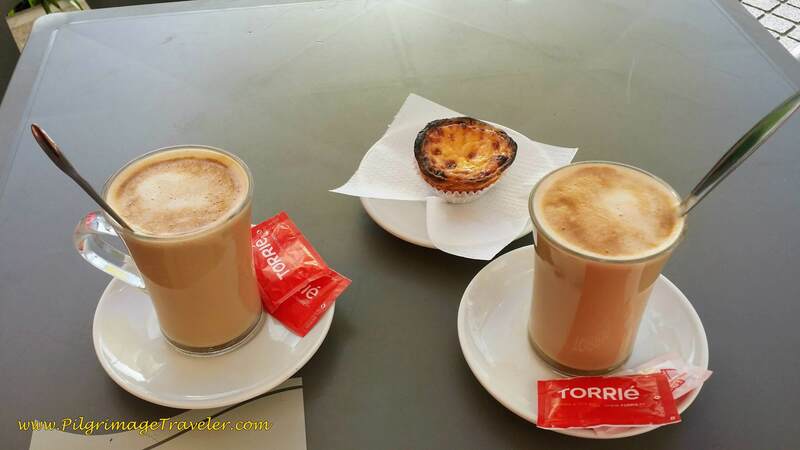 Café con Leite and Pastel de Nata! No sooner had we finished our delights when a bicyclist showed up with his walking partner close behind! While we had made our own road by walking, it was a great pleasure to meet up once again with our Aussie mates! After our break, we chose once again to make our own roads. We had different walking styles and paces, but we knew we would meet up again eventually. 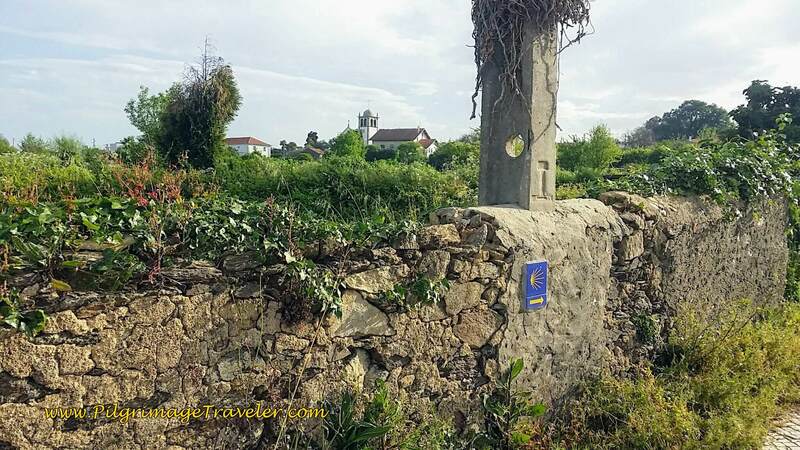 Partially because our days were shorter with more frequent breaks, and partially because I was beginning to really get my Camino mojo, I was now feeling great on day thirteen of the Camino Portugués. Or maybe it was because we saw our friends again? Or maybe it was the caffeine and sugar? Whatever the reason, it was working for me and I rolled with it! 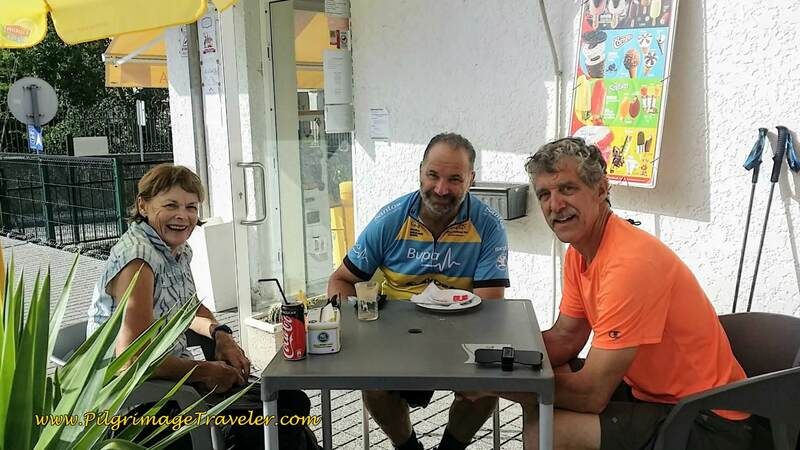 There are plenty of cafés in Pinheiro to take a break! After walking straight through Pinheiro de Bemposta, the road became the Rua da Banda de Música or the "Band Street Music." However this delightful street got its name, I didn't care, but it sure brought sweet music to me as I walked upon it! And soon enough, the all-too-familiar N1 was up ahead in our path, and we crossed up and over it on this wonderful pedestrian bridge. 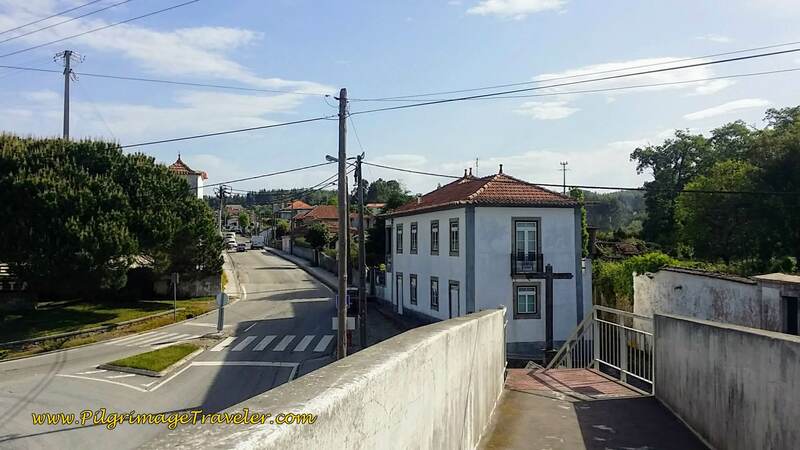 The view of the Rua do Pinheiro from the top of the bridge was lovely, as we scanned the horizon towards our next destination. 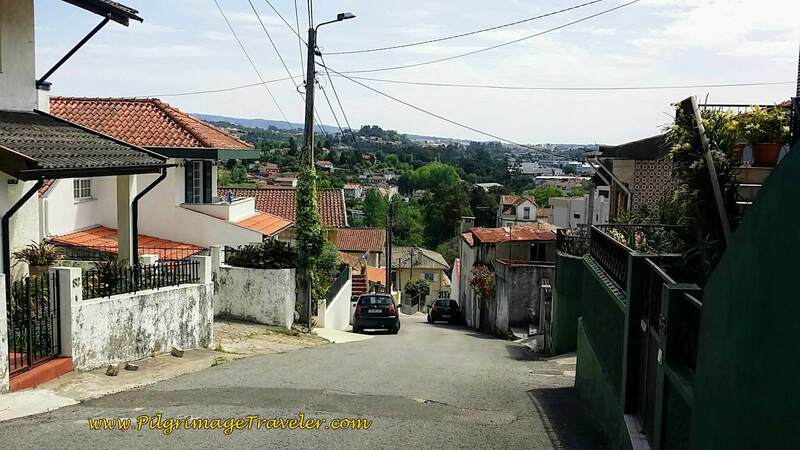 From the Rua do Pinheiro, we turned right on the street below, toward the historic town of Bemposta. 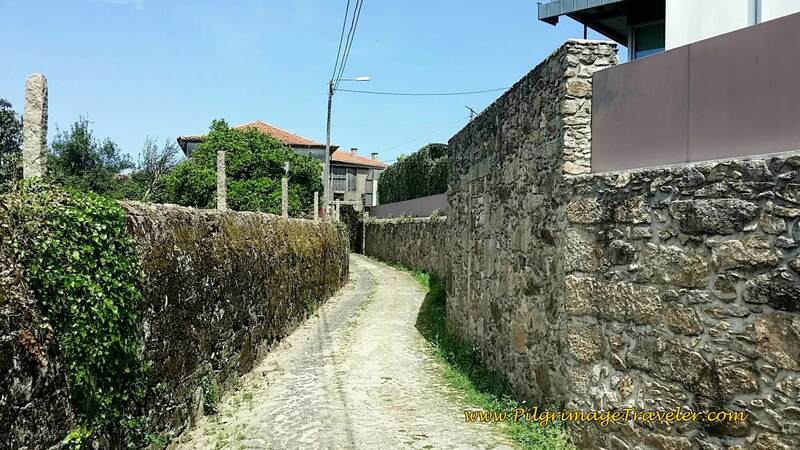 The Rua Dom Manuel becomes more narrow as it nears the historic section. The historic square of the town can be seen below. We had no tour guide to elucidate us regarding the nature and importance of these buildings. Even though we knew little, the town enchanted us, nonetheless! 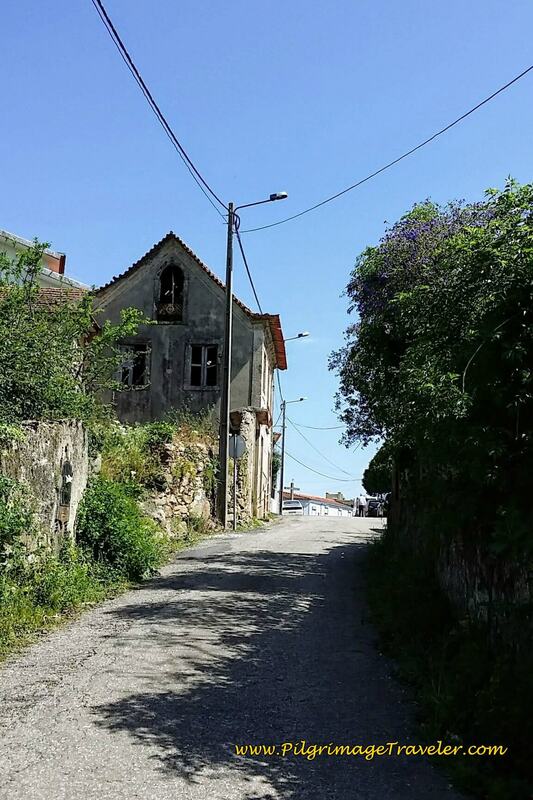 I thoroughly enjoyed this walk back in time through Bemposta. I wish I could locate more of the town's history, but I could find nothing on the internet. 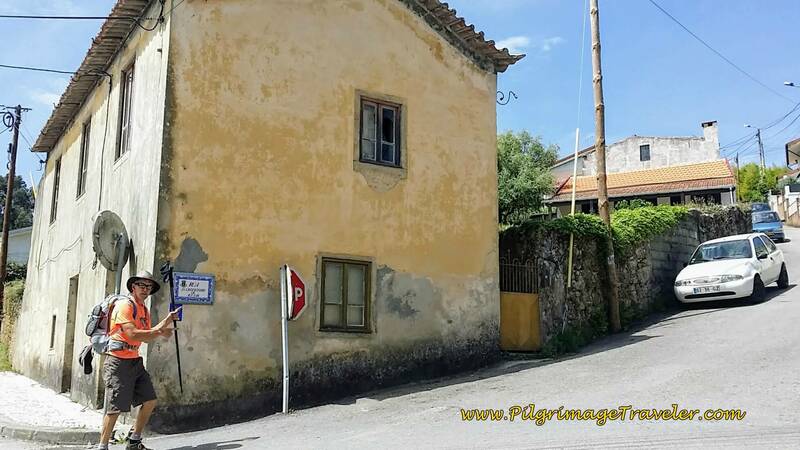 Were these 18th century buildings? If anyone knows, please comment below and educate all of us pilgrimage travelers! Then down the hill, around bends to cross over the N1 once again, paralleling it on the western side. 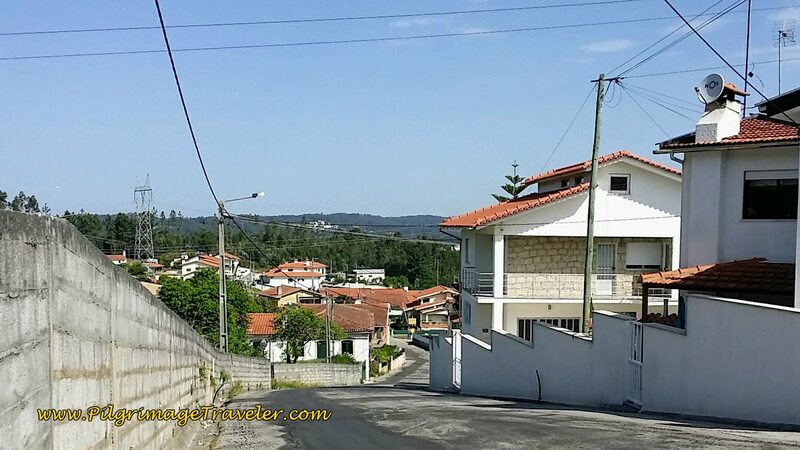 We walked on to the town of Besteiros and joined the Avenida do Espiritu Santo, below, and down another hill. 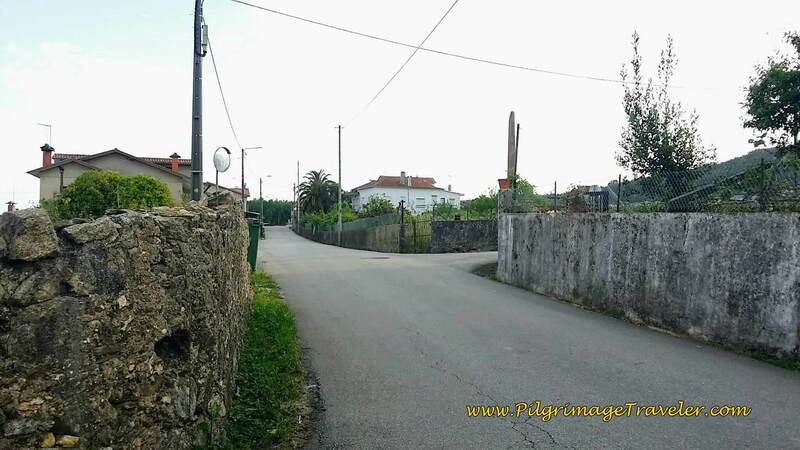 We made our road for about one kilometer along the Rua de Estrada Real, before turning and bending numerous times, following waymarks and arrows through the countryside and small villages. 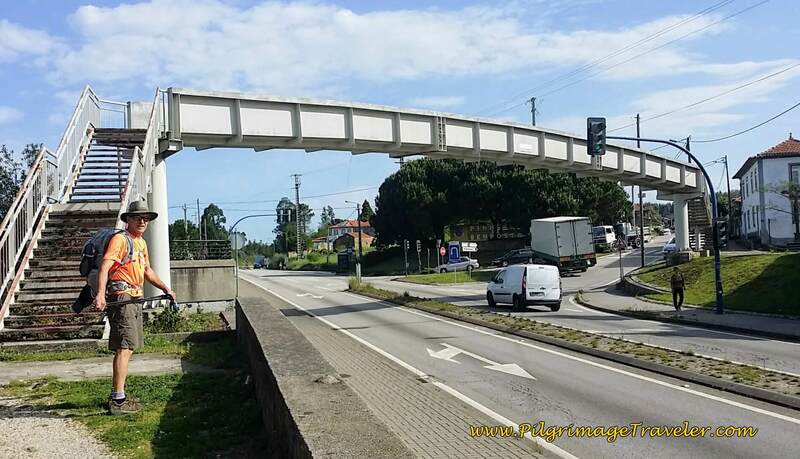 We were continuing to essentially travel north and parallel to the N1 (IC2) towards the next town of Travanca. 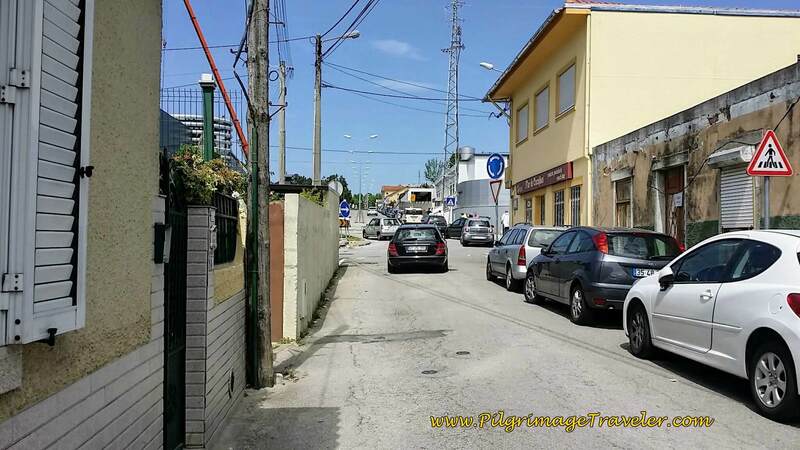 And then we turned left onto the N1, now the Rua do Pego, after a roundabout. After a full kilometer on the N1, we missed a turn to the right on a lovely side road. We totally missed the yellow arrow on a concrete pole telling us to turn off. 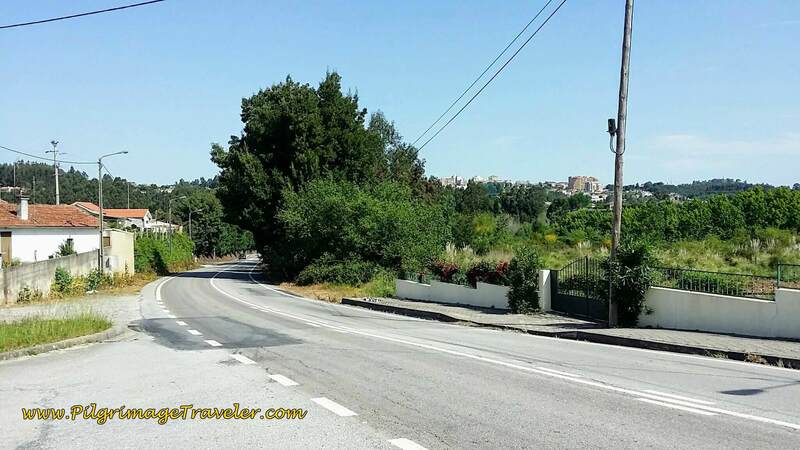 The N1 gets much busier and steeper as we got closer to Oliveira de Azeméis, the next major town, as you can see below. It is definitely better to get the turn right! If you zoom in on the map above, you can see where we made our error, just south of Oliveira de Azeméis, denoted as Point A for your clarity. We quickly realized we were headed the wrong way, as we looked to our right and down into the valley and saw our Aussie friend Chris riding his bike! We were like, "What??" I checked my reference GPS tracks on my phone and sure enough we had missed a turn. 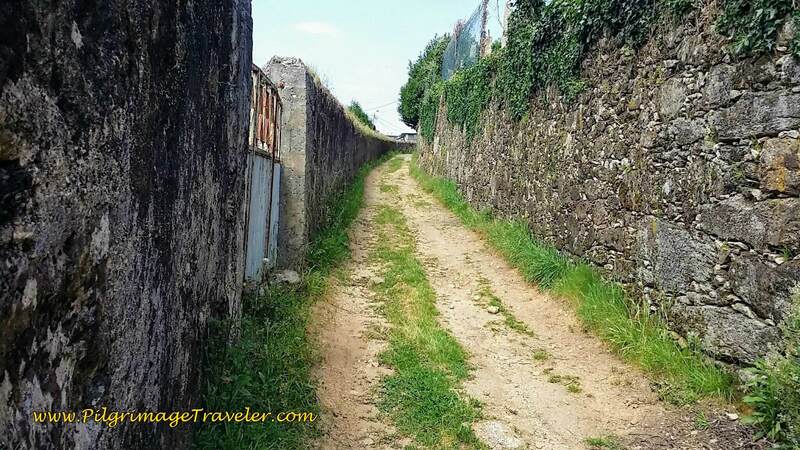 I could easily see how to rejoin the actual Camino up ahead. 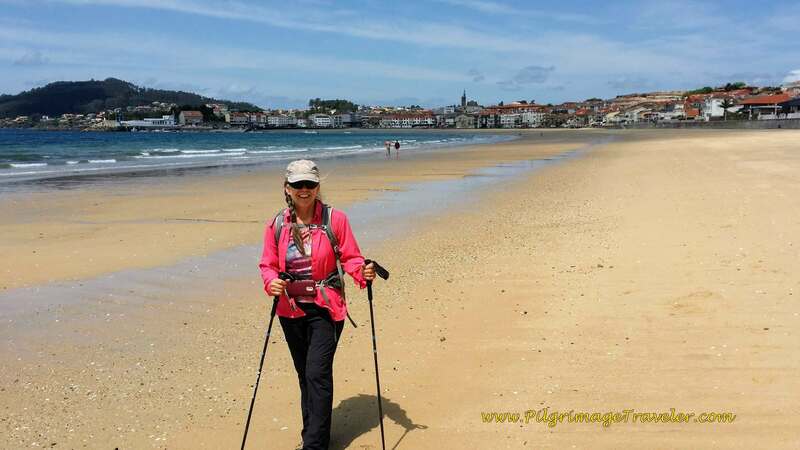 We rejoined the actual Camino at Point B on my map above! 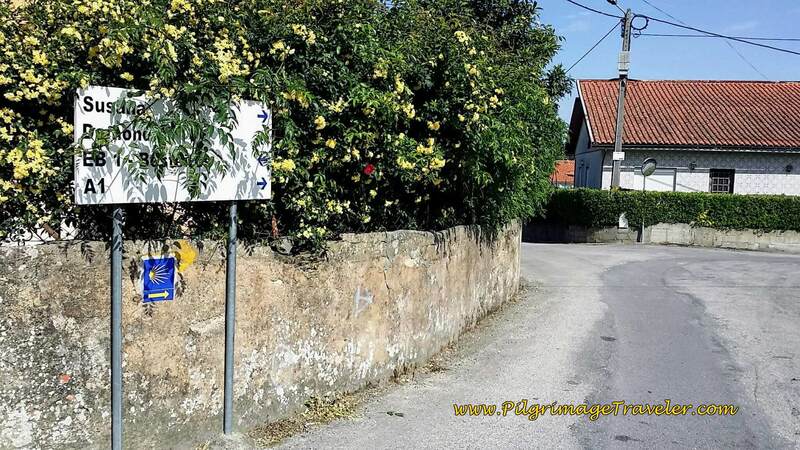 This would prove to be the only error we were to make on our entire Camino Portugués! 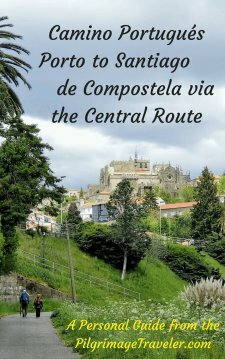 I was bummed that I even missed a few steps on the actual Camino, but not bummed enough to go back! 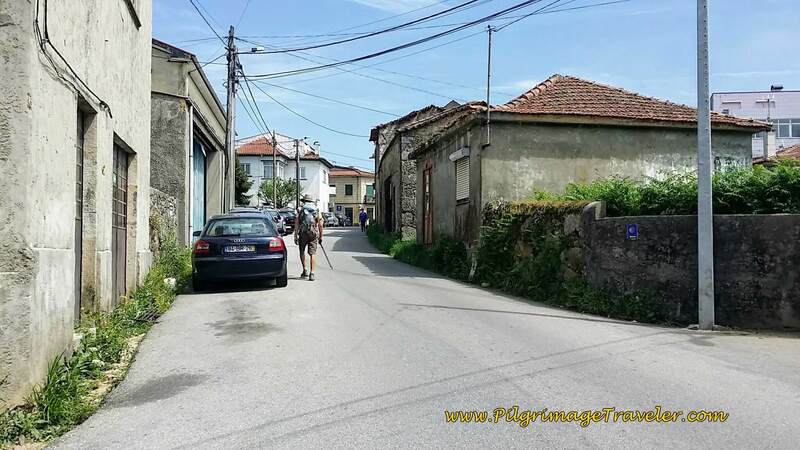 Here is the juncture where we picked up the Camino once again. 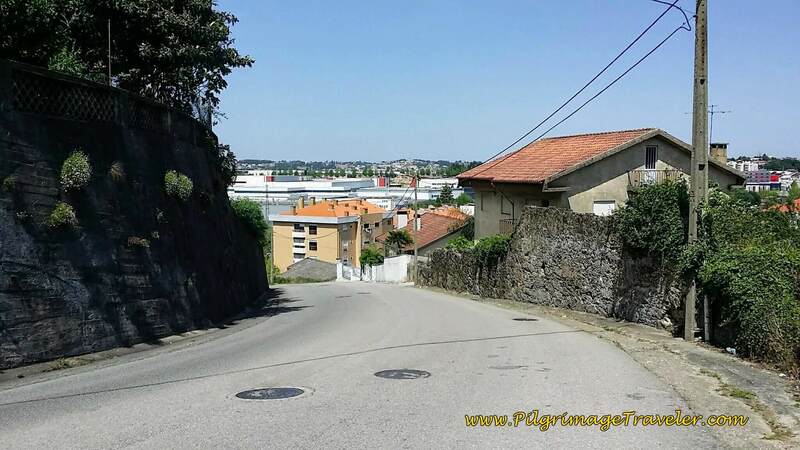 It was a steep climb up this hill, as we looked back on the actual route, below. 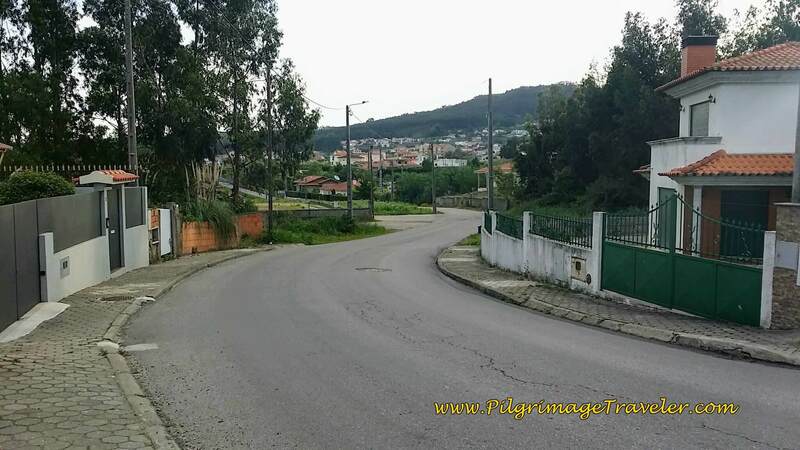 There was even more hill climbing as we turned up and onto the Rua do Cruzeiro, below. 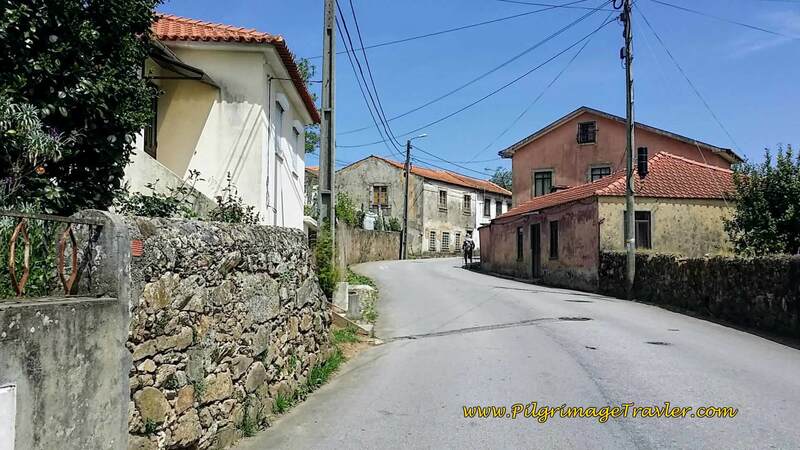 Then the Rua do Cruzeiro gives way to a larger street and we were in the center of Oliveira de Azeméis. 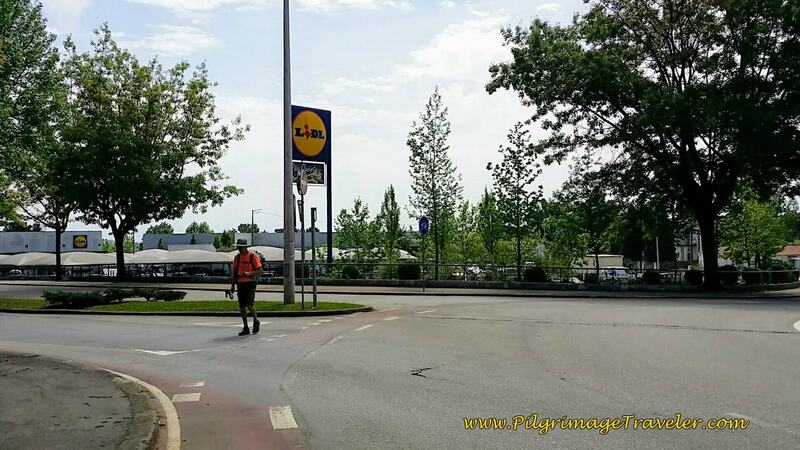 And wouldn't you know it, we spotted Chris on his bicycle ahead! Wherever Chris was, Christine was not far behind and we joined them to find a nice place for lunch. We were all carrying our own food, so we headed to the central square to sit and have a picnic. 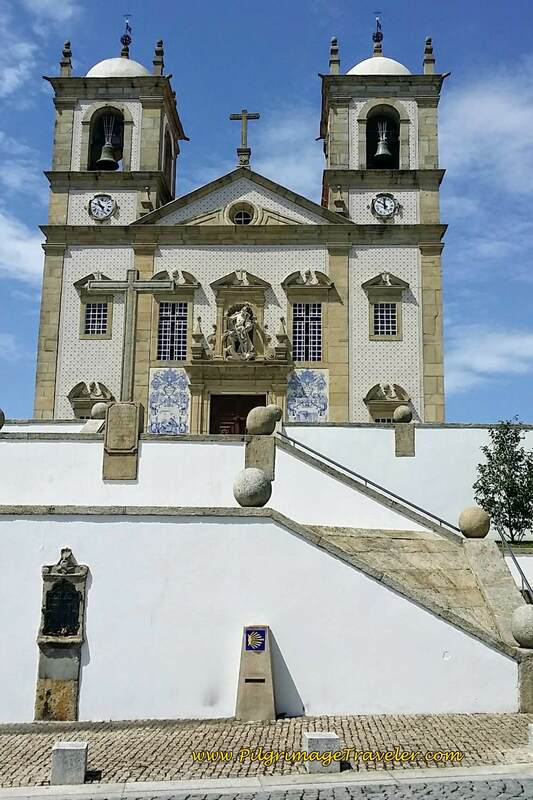 It was in the town square, the Praça José da Costa that we sat in the park for lunch with our friends from Down Under. We had logged in about 13 kilometers so far, a bit more than half of our day. 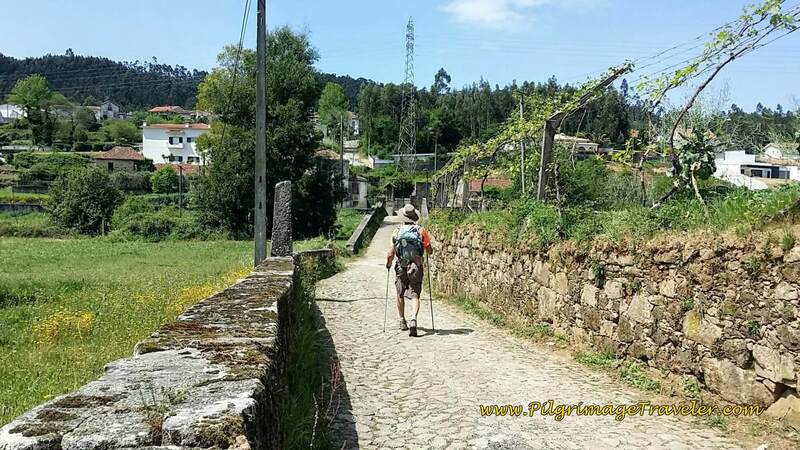 We gathered up our things, put back on our shoes and socks and set off once again to complete day thirteen of the Camino Portugués. 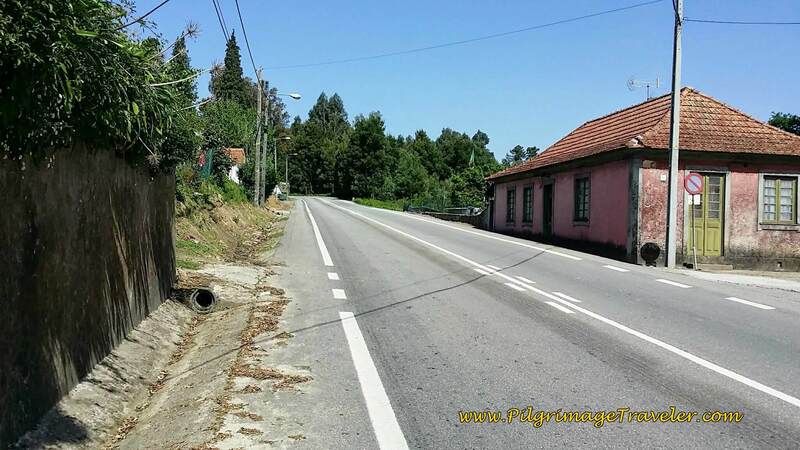 I estimated that we had about 9 more kilometers to go to São João de Madeira. 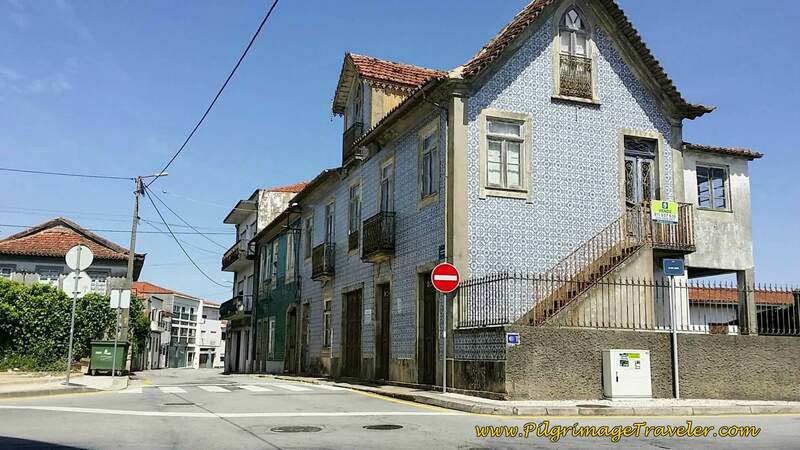 ...and up the hill to join the Rua António Pinto de Carvalho at this most interesting blue-tiled building. 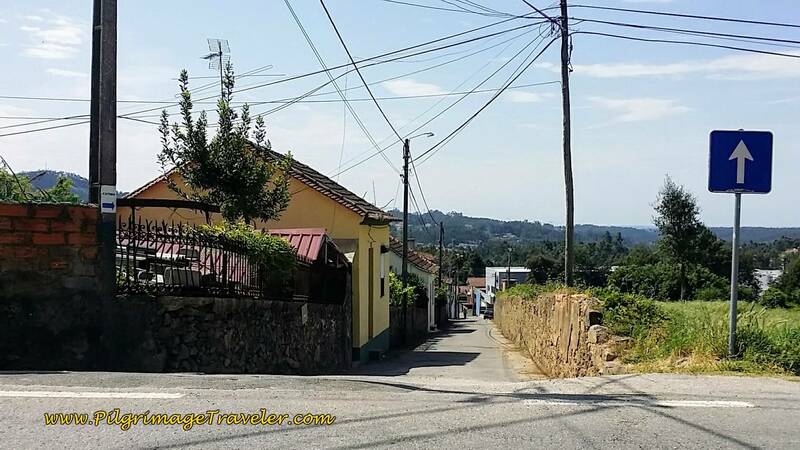 ...following the yellow arrows as the Way bends and turns through the suburbs of Oliveira de Azeméis. 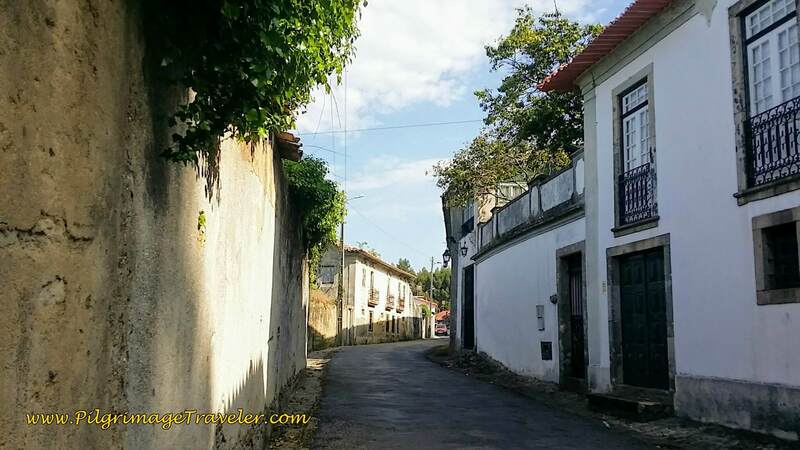 ...then left onto this fun, high-walled street, the Rua da Sardoeira. The high walls definitely gave this section a more medieval feel. ....and to this old medieval bridge. We saw many open cafés before and after this bridge. ...and around to the south side to get a close-up. 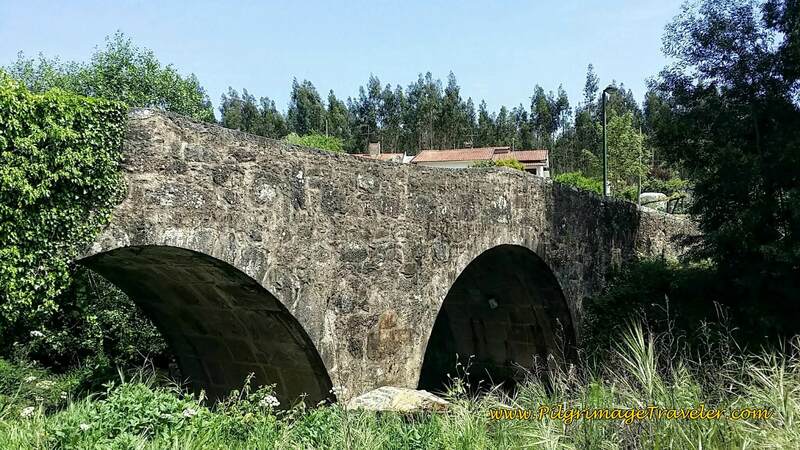 It is a wonderful old bridge. Passing over it kicked in our imaginations, as we envisioned ourselves in times of yore with our staffs and gourds filled with water strolling along the bridge! 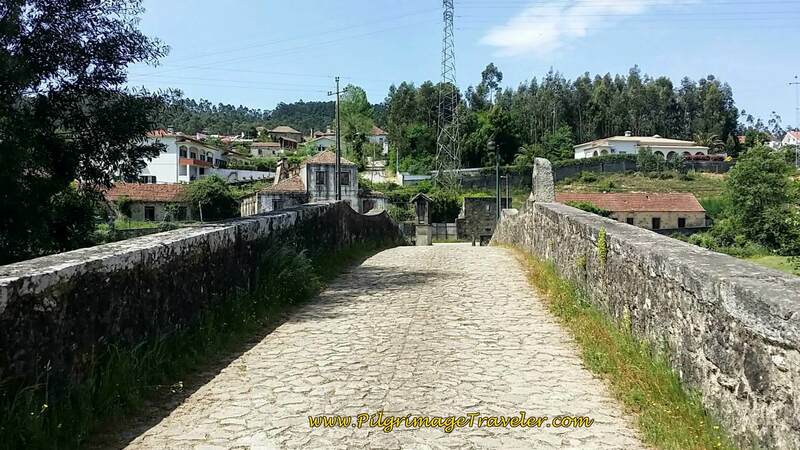 Immediately after the wonderful historic bridge, the Portuguese Way turns left and onto the street below, to walk into the town of Vila de Cucujães. 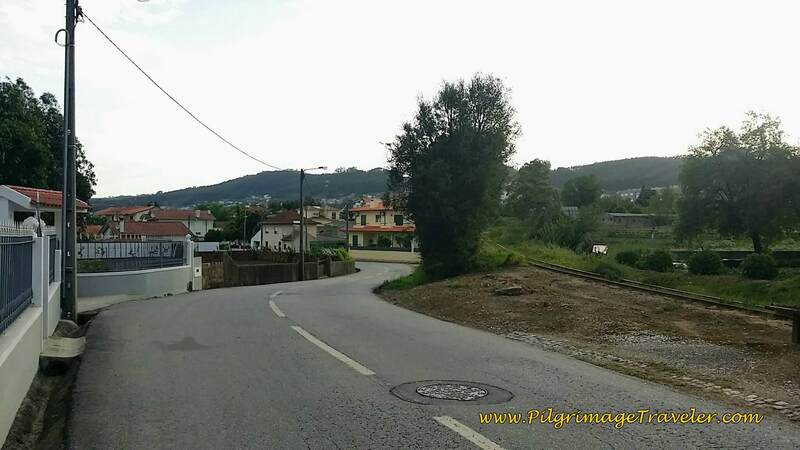 We turned right on the Rua do Ferral and more hill climbing was needed. It was hard work in the heat and on the pavement. 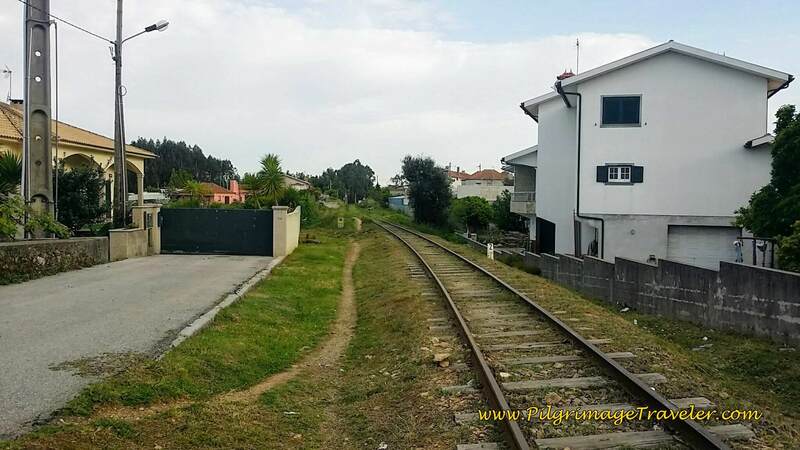 ...then in one more kilometer comes to Faria and crosses the railroad again. 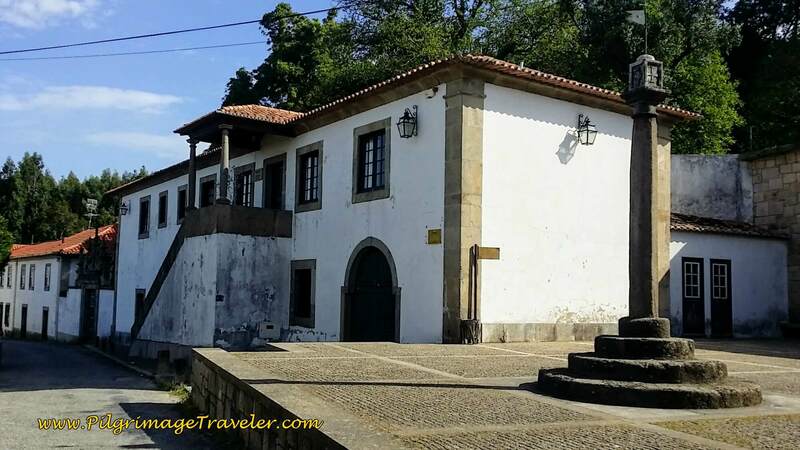 After the railroad crossing, the pilgrimage traveler truly arrives in the outskirts of São João de Madeira. 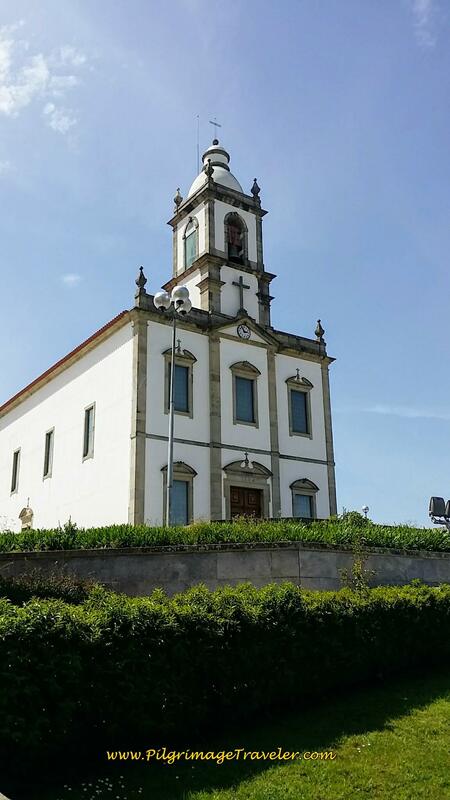 For the final approach, we walked up the hill and this church loomed above us to our left. 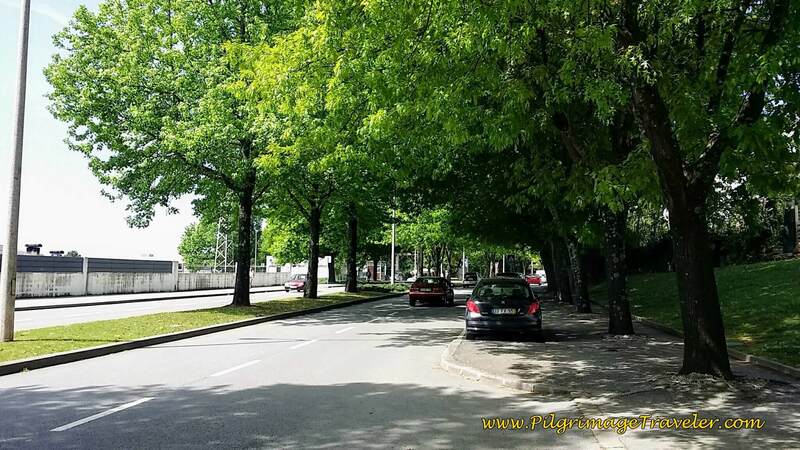 It was here that we turned left onto the Rua Visc. 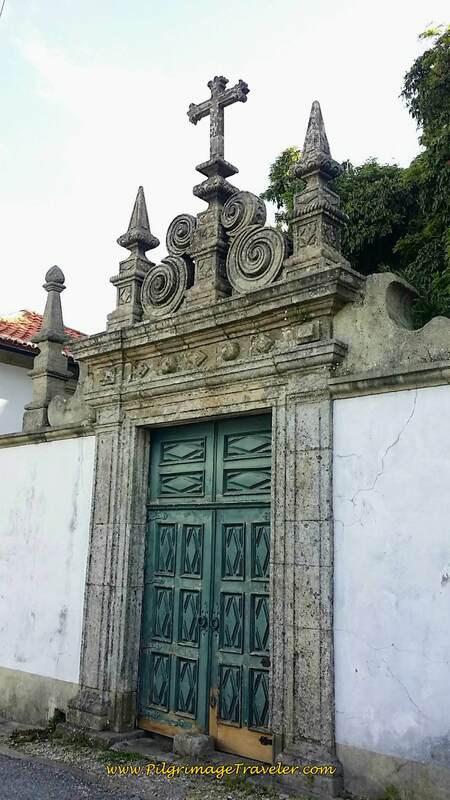 de São João de Madeira. 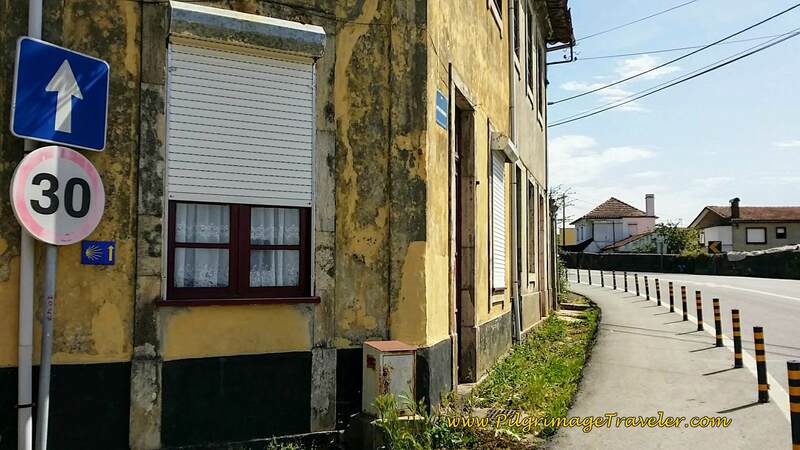 The Rua Visc. 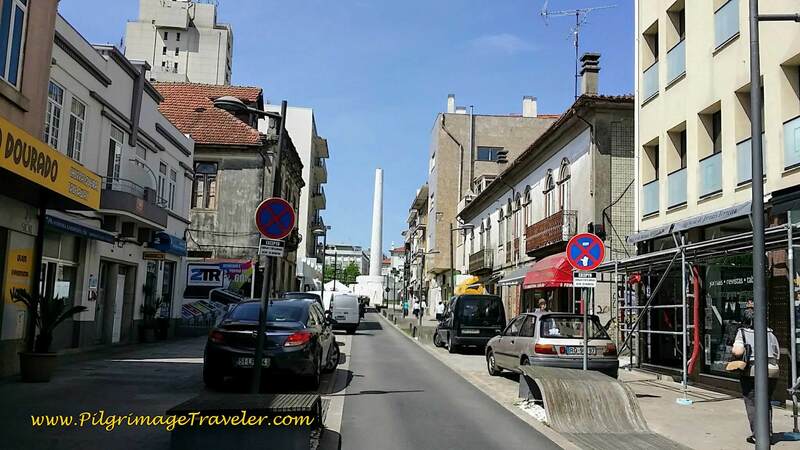 de São João de Madeira is a narrow street that led us to the final destination, the square in the center of town, marked by this white pillar in the photo below. After a beer break in a cafe in the square, we walked to our hotel the Central Suites Impacto, mere feet from the square. It is a wonderful new place, very modern with private rooms, a shared kitchen and living area, a rooftop sitting area and BBQ grill for you to use. You can click on the link to see the photos of the place. I would highly recommend staying here, and you can't beat the location, just steps from the central square. The hotel is up stairs on a higher than ground level and you have to call a number posted on the door, upon your arrival, for someone to let you into the building. The staff is ultra-friendly and helpful and speak great English. 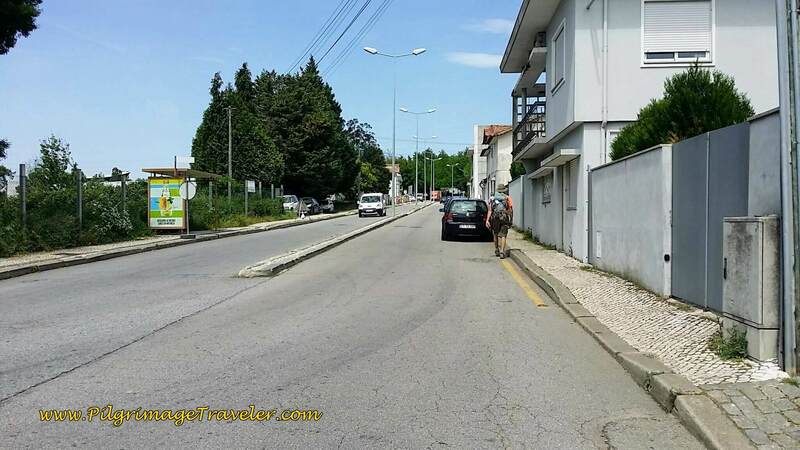 There is an albergue in town (see the accommodation file) and several other hotels in town. For pre-booking click here. And for the third time on day thirteen of our Portuguese Way, we ran into our Aussie friends and joined them for another lovely dinner. It was a special day indeed. This was the day we walked on and didn't look back, made our own walk yet met up with friends. Yes, our footsteps became the road, a road filled with history and enchantment. At times it felt we were indeed one with the road. There was no more struggle, only the singular purpose of putting one foot in front of the other. We had reached a comfortable rhythm of our own walking. 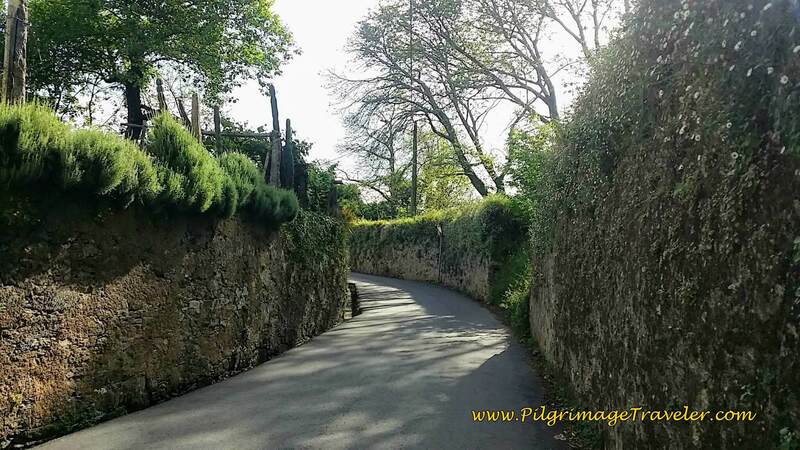 May your own day thirteen on the Camino Portugués bring you into oneness with the road! May you always look forward and never back, and make your own road by walking! 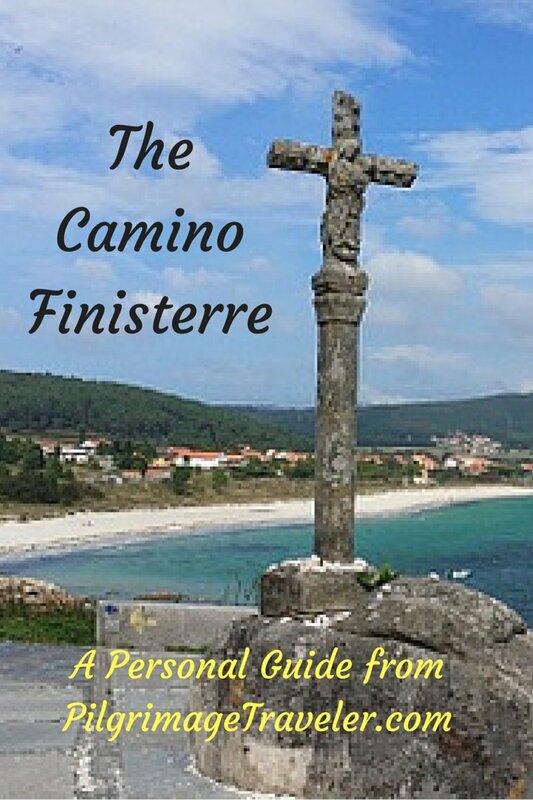 Downloadable Camino Portugués eBooks in PDF Format ~ Get Your Copy Today! NEW! 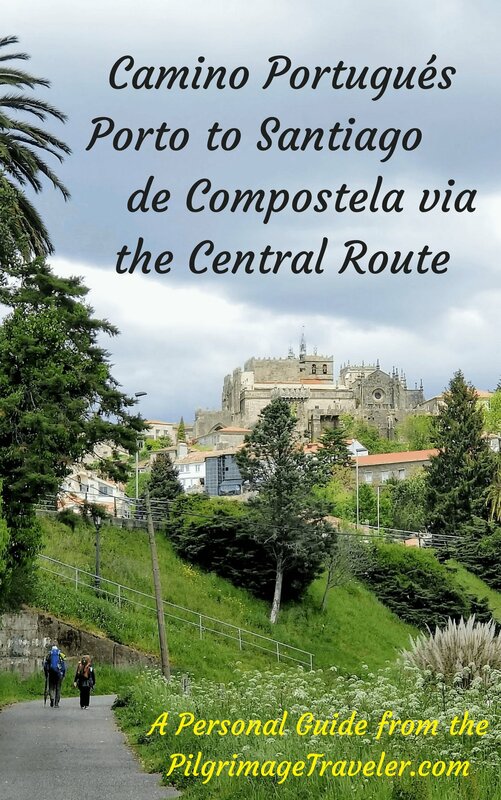 Camino Portugués, Porto to Santiago de Compostela via the Central Route Ebook - Now Available! Have you had a similar experience, or have something you'd like to share? We would love to hear from you! Please leave us a comment in the box below. Many readers contact me, Elle, to thank me for all the time and care that I have spent creating this informative website. If you have been truly blessed by my efforts and wish to contribute, I am very grateful. Thank-you! 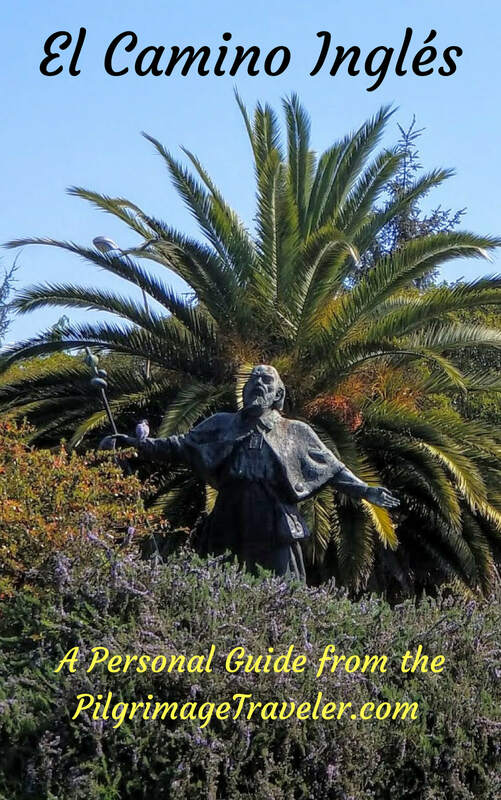 (Please note that by clicking the Donate button, you will be directed to the Body Window, LLC, of which The Pilgrimage Traveler is a subsidiary). 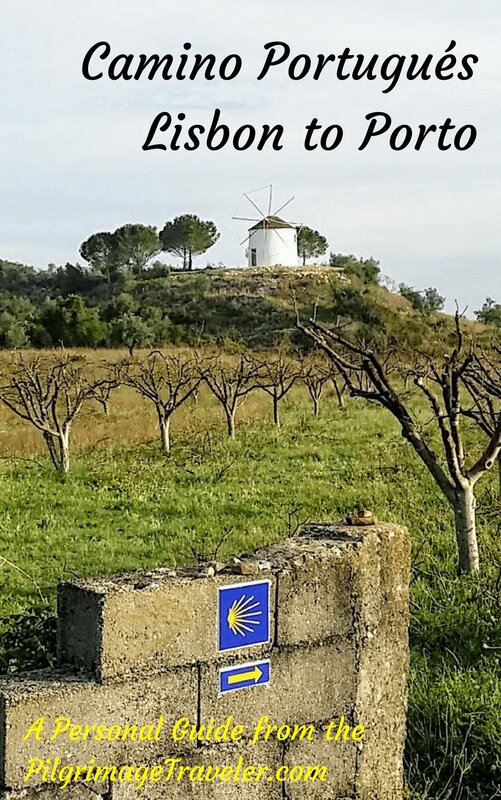 The Camino Inglés eBook is now available as a PDF download for you to purchase. 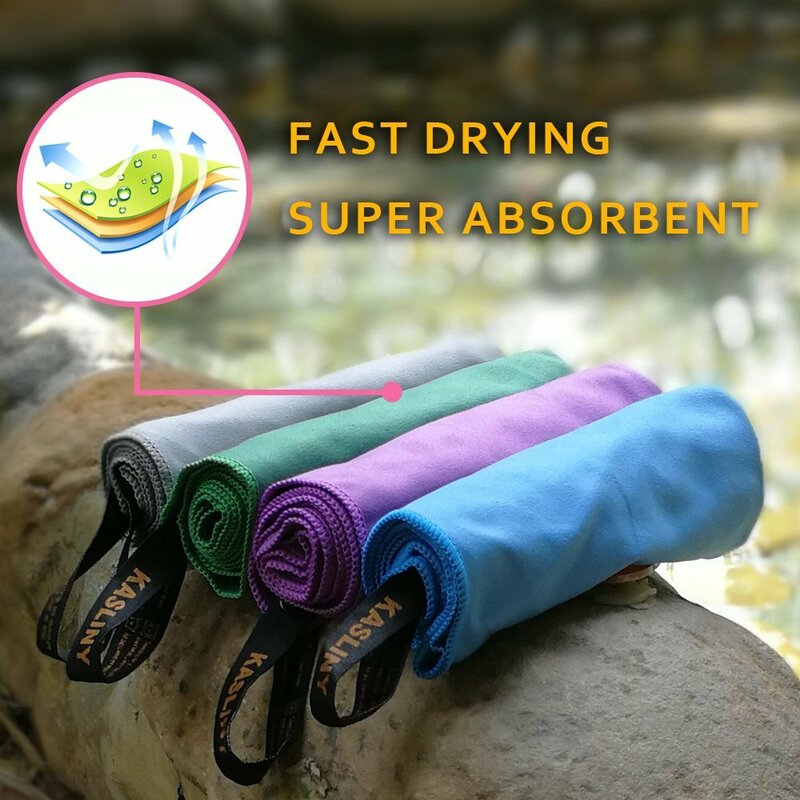 Just click the "Buy Now" button below the photo and use your credit card or your PayPal account. It's as easy as 1-2-3. 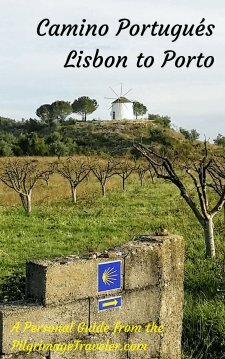 The Pilgrimage Traveler Digital Guides! 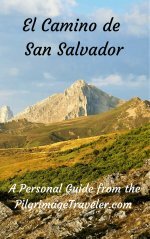 All Banners, Amazon and Booking.com links on this website are affiliate links. 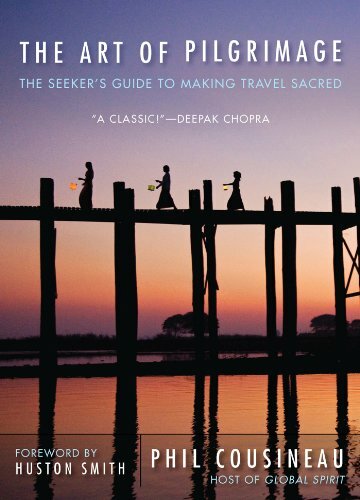 As an Amazon associate and a Booking.com associate, the Pilgrimage Traveler website will earn from qualifying purchases when you click on these links. We have used and love all of our recommendations and believe you will too! We sincerely thank-you! Need suggestions on what to pack for your next pilgrimage? Click Here or on the photo below! These poles get a 5-star rating on Amazon! An ultralight backpack should serve you well for years, like my Gregory has - six Caminos in all! 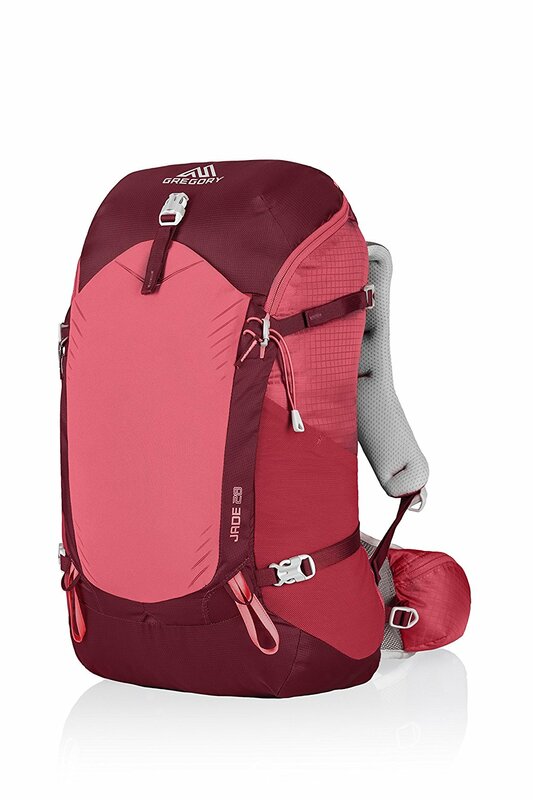 My 28L Women's pack gets a 5-star on Amazon (Ones for Guys too)!